Hopes and vague promises didn't fly with Bush administration courts, or even two years ago. But here we go again. The federal government has just come out with a new biological opinion (BiOp) on how to conduct the operations of its Columbia River system dams. The feds have been issuing Columbia River BiOps since Bill Clinton sat -- and did whatever else he did -- in the White House. And for all that time, the federal courts have been slapping them down. If history provides a guide, this new BiOp will soon be the target of litigation by conservation groups and it, too, will eventually be tossed out by the courts. "Unfortunately," said Save Our Wild Salmon executive director Joseph Bogaard in a press release, "this latest blueprint is virtually indistinguishable from the plan rejected by the district court in 2011." The Columbia River system drains a quarter-million square miles, an area roughly as large as France. The Columbia itself rises in British Columbia, 1,200 river miles from the Pacific, and is joined at the Tri Cities by its largest tributary, the Snake, which rises in Wyoming. For millennia, the Columbia was the greatest chinook salmon river in the world. Up to 15 million wild salmon of all species made their way up the river to spawn. Tribes all along the river caught, dried and ate the salmon. Because it drops so far (roughly half a vertical mile) on its journey from the mountains to the sea, the Columbia has more hydroelectric potential than any other river in North America. From the 1930s to the 1970s, the federal government built a series of dams on the Columbia and its tributaries, including the Snake. Those dams, known collectively as the Federal Columbia River Power System, still generate some 40 percent of the electricity used in the Northwest -- some of it in Seattle and Bellevue -- and enable tugs and barges to travel all the way to Idaho. The dams blocked salmon passage to and from salt water. Some were built with fish ladders. Others weren't. Once the dams went in, the numbers of fish plummeted. This came as no great surprise. Dams haven't been the salmon's only problems. Columbia River salmon runs were clearly being overfished by the late 1800s. Much of the river's estuary has been filled in. 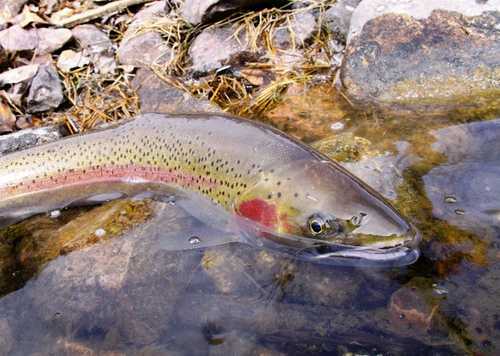 Spawning streams have been affected by farming, ranching and development. To increase survival rates, for many years the U.S. Army Corps of Engineers has trucked young salmon downstream around the dams. Federal, state and tribal hatcheries have pumped out many millions of fish. The river still supports only a fraction of its former runs. Starting in 1991 with the red fish (sockeye) of Idaho's Redfish Lake, Columbia and Snake river salmon populations have been listed as threatened and endangered species. Because of this, the federal government has had to issue biological opinions on whether or not operation of the dam system will jeopardize their recovery. Four BiOps have already been rejected by federal courts. Like its predecessor, this BiOp relies heavily on habitat improvements rather than changes in dam operation; the court may or may not be convinced that these improvements will really happen -- or that they will produce the benefits that the federal agencies predict.